I’m afraid I’ve gotten behind on the installments of our story. So this week, two installments. Happy reading! Henry could not get away quickly enough. He’d had his fill of his sister’s meddling. He hated leaving Hannah alone to fend for herself, but he had learned firsthand that she was quite capable speaking her mind when it was necessary. Still it troubled him, imagining Helen grilling her relentlessly as he knew she could and would. Charles was waiting for him. In a small town it is impossible to maintain any sense of privacy. News of Helen’s early arrival was already buzzing through town. She rarely visited. Two times in a week was certainly something that required further investigation! Charles glanced nonchalantly at Henry when he walked in the door; nodding with a smile. He noticed that Henry was clearly flustered and slightly disheveled, which was not at all like Henry who has impeccable taste when it comes to grooming and attire. “You look a bit bothered, Henry. Is everything alright?” Charles queried with all the concern he could muster, so as not to be found out for knowing the answer before he asked it. “Oh, she is very much alive and well. 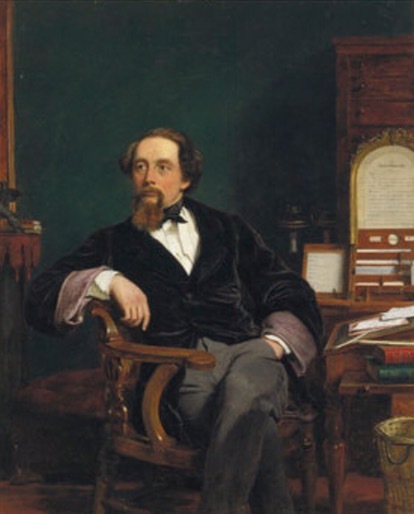 Save your worries, Charles, and she is in my house this morning as we speak.” Henry fumed. “Rushed is all. I have a full day ahead of me.” Henry countered as he picked up his pen and scribbled on a piece of paper on his desk. Normally counting the hours until the closing whistle, Henry hoped today would linger as long as it pleased. He dreaded facing what waited for him at home. Filled with excitement, Hannah giggled and hugged Helen before skipping happily out of the room. Helen smiled as she watched her leave. “I like her. I like her very much.” she thought. Then directing her comment to the vaulted ceiling, she spoke aloud, “Well Alice what a surprise this has all been. My my, you were right, my dear. She was out there somewhere just as you suspected. I do think you’d like her. She’ll be good for our Henry.” Helen blew a kiss into the air and gently tapped her chest over her heart before leaving to join Hannah in the parlor. The market was bustling with activity when they arrived. Hannah couldn’t resist pausing at each shiny storefront dressed with a variety of wares. There was a bakery shop displaying stacks of crusty bread and pastries, a hat shop, with velvet, feathered wonders and an emporium with household odds and ends. When at last they had arrived, Hannah’s eyes grew wide as she gazed at the most beautiful gowns and dresses she had ever seen. Jonathan eyed Hannah from head to toe, as if calculating her measurements in his head. She extended her hand to shake his, “So nice to meet you,” she smiled. Jonathan directed the ladies to a rack of wispy frilly dresses in silk, chiffon, crêpe, and satin. He slid hangers left to right, glancing frequently over his shoulder at Hannah. At last he stood back with a sigh and turned to present his find to Hannah and Helen. “Let’s try this one on you my dear,” he said with a wink and a smile directed at Helen. “Oh Jonathan! You have outdone yourself. This one is exquisite.” Helen gushed. Hannah gingerly took the dress from Jonathan’s hands and turned, stopping for a moment. 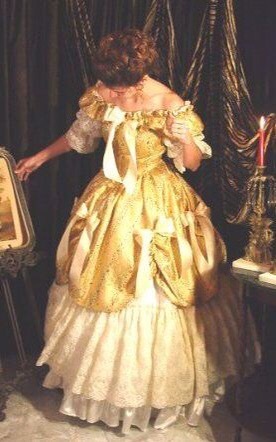 Hannah slipped the yellow silk chiffon dress over her head letting it cascade in a whoosh around her ankles. It fit perfectly. She gazed at herself in a full-length mirror feeling like a princess. Helen and Jonathan were waiting in a sitting area chatting and snickering over the latest gossip when Hannah appeared in the doorway. To read other installments of this fiction series click HERE and scroll down to the story entitled Seasoning. This entry was posted on Saturday, February 11th, 2017 at 7:35 pm	and tagged with Fiction Series, seasoning, Short Story and posted in Fiction Series, Short Stories (300+ Words). You can follow any responses to this entry through the RSS 2.0 feed.